Trix 16582 Ånglok med tender klass G 12 K.P.E.V.  Ånglok med tender klass G 12 K.P.E.V. Ånglok med tender klass G 12 K.P.E.V. Denna produkt ger dig 2997 bonuspoäng. Ånglok med tender klass G 12 K.P.E.V.., loket har DCC digitaldekoder, motor med svänghjul, drivning på 5 axlar, längd över buffertar 116 mm, epok I.
Prototype: Royal Prussian Railroad Administration (K.P.E.V.) class G 12 (later the class 58.10-21) steam freight locomotive. With gas lighting and a Prussian type pr. 3T 20 tender. The locomotive looks as it did shortly after being delivered by Borsig in 1917. Locomotive 10.282 in the delivery book for A. Borsig Works, Berlin-Tegel, Germany. 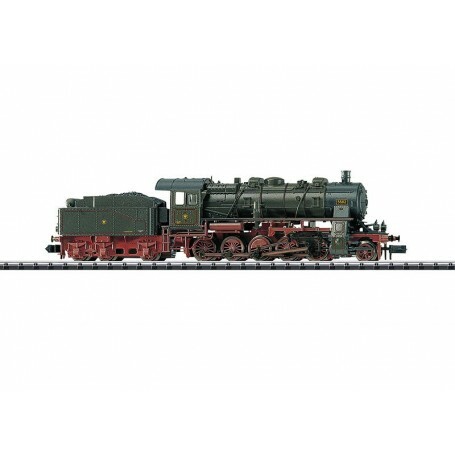 Model: The locomotive and tender are constructed chiefly of die-cast metal. The locomotive has a built-in digital decoder for operation with DCC, Selectrix, and Selectrix 2. The motor has a flywheel, mounted in the boiler. The locomotive and the tender are close coupled. 5 axles powered by means of side rods. Traction tires. Length over the buffers 116 mm / 4-9/16'. Soon after the start of World War I, the German war ministry realized that the variety of different steam locomotives not only affected railroad operations important to the war greatly but also their maintenance. In 1915, the war ministry therefore promoted the development of a powerful standard design freight locomotive with an axle load (16 metric tons) as low as possible. In order to get to a conclusion quickly, a commission was formed consisting of representatives of the railroads and also of the military. In the end, the Prussian members imposed the construction of a 2-10-0 super-heated steam locomotive. At the start of 1917, the Borsig Works were given the contract to generate designs for the new locomotive. Borrowing from a 2-10-0 locomotive for Turkey, the new 'standard design locomotive' was developed in a very short time. The first units were finished in 1917 and were given the designation G 12 in Prussia, Württemberg, and Baden. In Saxony, the G 12 was run as the XIII H. With a boiler height of 3,000 mm / 118-1/8', a Belpaire firebox, and a continuous bar frame, these units had nothing more in common with the Prussian tradition of building locomotives. The low bar frame allowed the firebox to be placed on the frame and above all to be widened on the sides compared to the previous sheet metal frame. For the first time the grate surface could be done not only in terms of grate length but also in terms of grate width. Other new features were the Coale design safety valves as well as equipping the locomotive with a feed water cleaner. Between 1917 and 1921, 1,158 units were built for the Prussian State Railways alone and later for the DRG by AEG, Borsig, Hanomag, Henschel, Krupp, Linke-Hofmann, Rheinmetall, and Schichau. The Baden, Württemberg, and Saxon state railroads purchased other class G 12 locomotives. In the DRG renumbering plan of 1925 the Baden G 12 units mutated to the DRG class 58.2-3, the Saxon G 12 (sä. XIII H) to the class 58.4, the Württemberg G 12 to the class 58.5, and the Prussian G 12 to the class 58.10-21. They were used in almost all of the German State Railroad districts. World War II moved numerous units abroad such as to Bulgaria, Austria, and Poland. Those units remaining on the DB were retired by 1953. The locomotives on the DR were by contrast indispensable for a longer period and ran in their original version until 1976 in the Erzgebirge area. Several G 12 units have remained preserved, among them the operational road number 58 311 of the Ulm Railroad Fans.